In Vegas, you’ve got plenty of steakhouses. Omakase sushi joints? Celebrity-chef outposts? They both litter the place. But a place to grab a more casual bite, or better yet, high-end ingredients to pull together your own meal… well, that’s harder to come by. Enter Eataly. “Eataly wouldn't be Eataly without a marketplace,” Nicola Farinetti, CEO of Eataly USA told us. “It was important to stay true to our philosophy of ‘eat, shop, learn.’” That concept means that here, you can certainly sit down to a nice meal at one of its restaurants, but you can also peruse a marketplace of Italian goods and watch cheese get made. And that’s an immersive food experience the Strip hasn’t really seen before. Would it be a Vegas vacation if you didn’t take in some kind of entertainment? We think not. And while acrobatics or feather-boa-rocking showgirls may not be everyone’s cup of tea, checking out live demonstrations of tasty food being made will (or should) be. Whether you want to see what goes inside an authentic Sicilian cannoli, learn how fresh pasta gets made, or just be mesmerized by hand-pulled mozzarella, all of it happens at Eataly, right before your very eyes -- and that’s a Vegas show we can get behind. 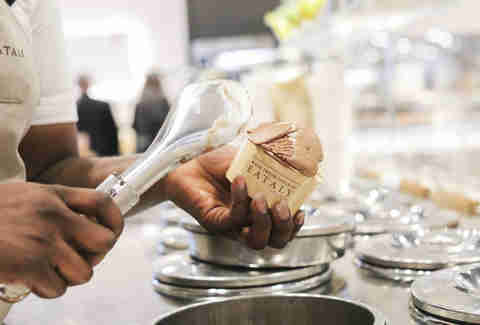 While Eataly Las Vegas predominantly features restaurants and eateries, their signature marketplace still packs a punch. Here, you’re able to shop for everything from 100% extra-virgin olive oil to bronze-extruded pasta to Italian wines. It isn't just a must-hit spot for Italian goods, either -- Eataly has partnered with farmers and suppliers in Nevada and California to offer up locally-sourced goods as well. So besides giving you the ability to serve a chef-worthy charcuterie plate in your hotel room before a night on the town, this is the spot to pick up some truly highbrow (not to mention, edible!) souvenirs. 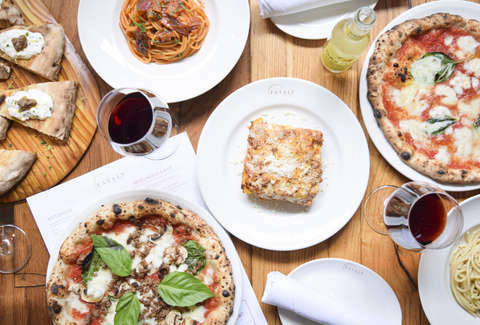 While there is obviously fresh pasta, Neapolitan and Roman style pizza, and an Italian bakery within these 40,000 square feet, in February, Eataly also rolled out the butcher-focused restaurant Manzo, meaning "beef" in Italian. (The intimate space also offers a respite from the bustling marketplace.) Manzo's centerpiece is a custom-built, three-tired, wood-burning grill (powered by white oak, apple wood, and coals) that flame-cooks all the prime cuts. To drink, there's a 400-bottle Italian wine list and a cocktail program that incorporates -- naturally -- Italian liqueurs.